Terrain Penalties: All terrain penalties are as stated in OUTDOOR SURVIVAL, mountains and swamps cost three movement per hex, crossing rivers at non-ford hexes also costs three, and woods or deserts cost two. Tracks through mountainous terrain cost two factors per hex moved, and tracks through woods or swamps incur no movement penalty. The only changes here are that swamp hexes cost 3 movement units (instead of 4), and that tracks through mountains cost 2 move units (instead of 1 in Outdoor Survival). 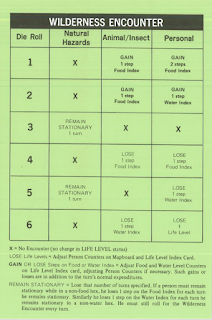 When I run D&D wilderness games, I ignore these minor changes, and actually just display this same movement chart from Outdoor Survival for my players' benefit. 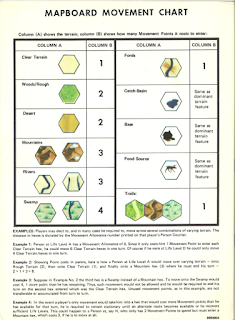 I consider this hex-based mechanic to be far more elegant for gameplay purposes than the more abstract system that was presented in say, AD&D, where only daily miles traveled were presented -- ignoring the fact that different types of terrain could be encountered within a single day, or that odd remainders of movement between hexes might need consideration. Having moves purely in terms of whole-number hexes neatly solves a whole number of problems during play. 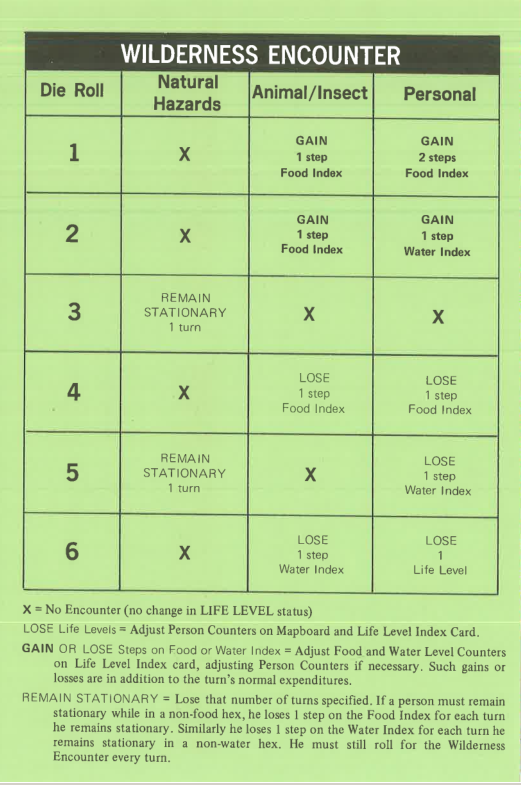 Outdoor Survival has a "Sequence of Play" that looks like this: (1) Select scenario and set players at full food, water, and health; (2) Determine order by random dice; (3) Roll for Direction ability and move counter; (4) Consult Necessities chart to see if food/water ration has been met for the day; (5) Mark any losses and reduced movement for the next turn. Repeat most of these steps until the game concludes. 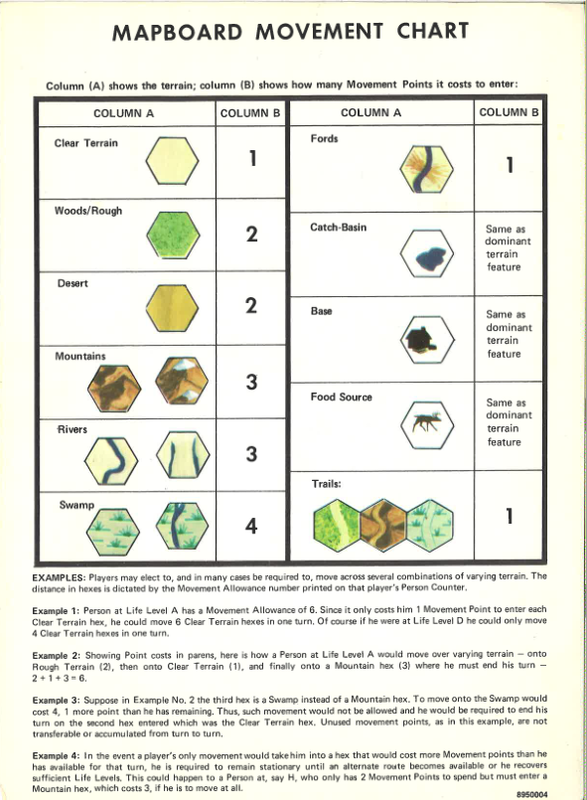 From a top-level design perspective, this idea of how to run wilderness adventures was ported directly into OD&D; the two daily rolls there are, indeed, one for being lost (direction ability) and one for possible monsters (wilderness encounters). Concepts that were stripped out were: rolls or assessment of possible loss of food/water, loss of mobility for reduced life levels, and encounters of types other than creatures. Outdoor Survival included the presence of inclement weather ("Natural Hazards"), alongside creature encounters, but that was left our for D&D. 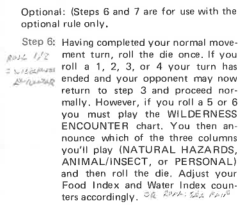 The other thing I want to point out is that Outdoor Survival, as simple as it is, includes an example of a non-uniform core mechanic; if you look at the Direction Ability charts (see last week), then on that d6 roll the player is penalized for rolling low, whereas for encounters here the player is penalized for rolling high (encounters only occur on 5-6 as above). I have found this prone to confuse players, so I penciled in a note to flip this latter roll around in play (see margin note above). When I first saw this chart, the contrasting sense of the dice-results made me wonder that possibly only a single 6-sided die was being rolled (with either a lost or monster result, never both together). But I think that reading the prior page carefully clarifies that two separate dice are rolled (technically: one is at the start of the day, the other at the end of the day). The fact that the mechanic is so transparently borrowed from Outdoor Survival makes that even more clear, I'm sure. And this same basic idea was also used in the dungeon setting, of course, for one of the most important but often controversial D&D mechanics: "A roll of 6 indicates a wandering monster has appeared." (Vol-3, p. 10). Again: High roll indicates encounter (disjoint from, say, the fact that low roll indicates surprise). But the idea of a "core mechanic" where all high rolls are uniformly desirable was something that was not on the radar of either Outdoor Survival or Dungeons & Dragons at that point in time. And that makes the shared DNA even more obvious in this rather telling case. Do you think the differences (roll high, roll low) was an attempt to help keep the pair of d6 results straight/differentiate in the player's head? No, I expect that it was just a total oversight. In Outdoor Survival they're on separate pages and I think that simply no one thought to consider them jointly. From that point on it was just legacy. Are there modifiers in the game for the rolls that work in the same direction: so making one roll more dangerous and the other one less so? 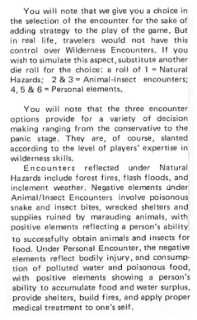 I do not own a copy of Outdoor Survival and find it very interesting to see how D&D is related to this game. No modifiers to those rolls; what you see above is the entirety of the mechanics. How do you apply D&D levels to OS skill? Do you do map D&D class levels directly to Outdoor Survival skill levels (i.e. level 4 in D&D means "use Scenario 4's movement and encounter rules")? Or do you you have a more arcane system for handling this interface? The rules sound interesting; the map always looked pretty poor to me. Do you think the game could be played on the Judges Guild Wilderlands maps? Possibly. I'll say that in play the map is excellent; it winds up providing a lot of interesting strategic choice and dilemmas on different routes of travel. I've actually recently come around to thinking D&D maps should be more like this for game purposes -- mostly clear with scattered obstacles, not realistic at all, but providing interesting and varied strategic obstacles. Good observations! I must admit that Vol-3 table also confused me until I did the exact same close-reading exercise. And I totally agree that the 6-mile hex is really ideal for gameplay.